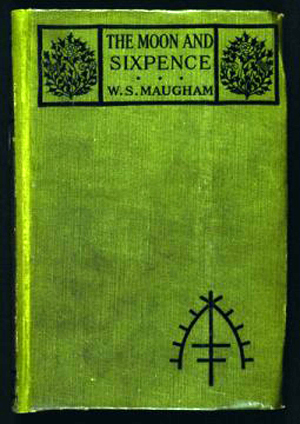 Those of you who have visited the exhibition may have spotted an edition of W. Somerset Maugham’s satirical novel The Moon and Sixpence, in one of our ‘Life and Times’ galleries. First published in 1919, the story is based on Gauguin’s life, with the artist recast as an Englishman called Charles Strickland (some of you eagle-eyed bloggers may have noticed a ‘Charles Strickland’ among the blog comments.) Strickland abandons his wife, children and a lucrative career as a London stockbroker, to follow his ‘destiny’ as a painter…sound familiar? He even ends up in Tahiti, in pursuit of Art and Beauty, and, in a final burst of creative genius, paints his masterpieces on the walls of his hut - despite being blinded by leprosy - and dies (ok, so this bit doesn’t sound quite right for Gauguin!) Maugham was clearly fascinated by the burgeoning Gauguin myth. In fact he went out to Taihiti in 1914 to visit where the artist lived and even bought a stained-glass painting there entitled Woman with Fruit (1896). He wasn’t the only one - the poet Rupert Brooke visited in the same year. Some of you may be familiar with Maugham’s novel via the movie made in 1943. This was the first ‘representation’ of Gauguin on film. It stars the British actor George Sanders, who seems to have spent his whole career playing ‘the cad’ - it has to be said, he was extremely good at it… But given how popular The Moon and Sixpence was in Britain and America, I can’t help but wonder how far Maugham’s unflattering interpretation has filtered down to the present and made an impact on our preception of Gauguin today….what do you think? yes art is only for ladies who lunch now I think we are all agreed! ooooooh,which jacket did you wear,muppet ? I loved it! Yes, I went at just the wrong time(11:30) but as a member I went back later after a delicious lunch in the Members room -isn't the new extension using a covered balcony a great idea! My friend and I particularly appreciated the two side rooms where we could see the wider issues of the periods of his life. Filling in historical details is always helpful ingiving a context to the works. I came away convinced that the pull to Tahiti was a direct consequence of those early childhood days in Peru! It's a book I haven't read since college, and I can't say I've seen the film since about the same time - skipping lectures to do the ironing and watch the Channel 4 b&w afternoon movie. I suspect that it doesn't have the impact directly that it once did, because so few people are aware of either the book or the film. (Ask the visitors before they go in if they have seen/ read either, or even if they could name the book...) Perhaps the impact of the book on the way he has been interpreted is in the past but this has then influenced the way each subsequent generation has interpreted him? Blog: Gauguin's Polynesian Eve? What do you think? Blog: An exclusive interview with Gauguin's great grand-daughter! Blog: Gauguin's puppies...What do they mean?